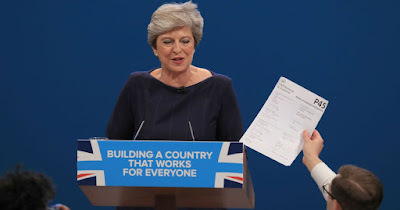 London Green Left Blog: How Long Will Theresa May Survive as Prime Minister? How Long Will Theresa May Survive as Prime Minister? I must admit that Theresa May has survived much longer than I expected, after she called a snap general election last year, which went so disastrously wrong, as May lost the Parliamentary majority that she inherited on becoming leader in 2016. What May has managed to do, largely by fudging decisions on Brexit, is to keep most of her MPs onside. One painful day after another. As was signalled by the so called ‘Chequers agreement’ though, the time for fudging decisions is nearly over. An agreement with the European Union (EU) on Brexit needs to be made by the autumn at the latest, if we are to have one at all. This is why May has finally shown her hand now with the strategy agreed with her ministers at Chequers, the prime minister’s country retreat. A Government Bill has been released reflecting this plan. But the agreement unravelled within days, with hard-line Brexit Cabinet ministers and lower ranking ones resigning from their posts, and Tory MPs from the European Reform Group inserting amendments to Bill that pretty much scuppers May’s plan. To try to salvage the essence of the Chequers deal, the government accepted the amendments rather than lose the votes in Parliament on these amendments, with May claiming her strategy is still on course. To make matters worse, the Tory rebels in the pro-EU wing of the party, who gave the Bill a tepid welcome, are in rebellious mode once again. It seems the prime minister can’t win whatever she proposes. She is back to fudging again just to get through to the summer recess next week, and try again when Parliament re-convenes in September. The idea apparently floated by Downing Street that recess be brought forward to avoid a challenge to the prime minister’s leadership, shows just how worried May has become. Tory activists are also in open revolt against the Chequers agreement as this post from Conservative Home details. The public appear to be just as unimpressed with May finally showing her hand, with two opinion polls since the Chequers agreement, finding the Tories slender lead over Labour has disappeared and Labour are now ahead by 4 or 5 points. The bookies make 2018 as the favourite year for May to be replaced, or to step down. These are the odds from Coral, but all the bookies have similar odds. Unless May can dream up some kind of Brexit that will please the majority of her party, and the only thing that will mollify the hard-line Brexiters is to crash out of the EU with no deal whatsoever, a leadership challenge is likely when Parliament returns in September. There may not be enough Tory MPs ready to back a challenger, but there are enough to force the issue, and to inflict a deep wound on May’s authority. Margaret Thatcher in 1990 led on the first leadership ballot with the votes of 204 Conservative MPs (54.8%) to 152 votes (40.9%) for Michael Heseltine, her challenger, and 16 abstentions. But she was four votes short of the required 15% majority, on the then rules, and a second ballot became necessary. It never happened, a wounded Thatcher resigned instead. If the hardliners don’t get what they want, they will be then left with no other option but to try and topple May and replace her with someone who will give them a no EU deal Brexit. No doubt there will be plotting a plenty over the summer and so it is likely a challenge will materialise in the autumn, unless May completely caves in to their obsession. This will make pro-EU Tory MPs very unhappy, and they may find a challenger themselves, or decide that the Tory party no longer represents their view and leave the party, but they could cause a general election by supporting an opposition no confidence vote in the government, along the way. Either way, a general election is made more likely, as any successor would be left with same problems and the same Parliamentary arithmetic as May has. Whoever might succeed May will need to change the complexion of Parliament to gain endorsement for their Brexit plan, if they have one. It seems to me that we do need a general election, because the whole of politics in this country presently is a complete shambles, which the Tories have ownership of. A change of government is sorely needed, not a change at the top of the Tory party, which has proved to be totally incompetent.